Reverend Martin Woulfe was raised in the Chicago area in the Roman Catholic tradition. 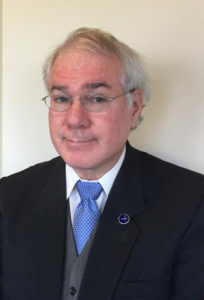 Martin joined the First Unitarian Society of Chicago in 1987 and several years thereafter enrolled in the Meadville-Lombard Theological School, which is associated with the UUA and the University of Chicago. While completing his Masters in Divinity coursework, which included a chaplaincy at Northwestern Memorial Hospital and an internship at the Countryside UU Congregation, Martin was granted preliminary fellowship as a UU Minister by the UUA’s Ministerial Fellowship in 1998. Martin served for two years as the Interim Minister at the UUCC in Park Forest, Illinois; the members there ordained him in March 2003. Prior to that settlement, Martin worked as an on-site house parent of a group home for teenagers connected with Maryville Academy. Martin also worked at the Maryville’s Emergency Service Shelter for abused neglected youth, both during and after his seminary training. Martin was called by a congregational vote to serve ALUUC as their first full-time settled minister. He and his wife, Angela, and daughter, Celeste, moved to Springfield in the summer of 2003. He assumed his duties here in August of that year. He has now completed fifteen years of service. Along with his pastoral duties, Martin has been active with Interfaith & Social Justice activities.